A NEW bedbug trap could hit shelves next year thanks to a team of biologists who bared their arms in the name of science, letting let thousands of bed bugs snack on them until they finally found out what combination of pheromones could be used to lure them before they take to your bed. "This trap will help landlords, tenants, and pest-control professionals determine whether premises have a bedbug problem, so that they can treat it quickly," says study author Gerard Gries, a biology professor at Simon Fraser University. "It will also be useful for monitoring the treatment's effectiveness." 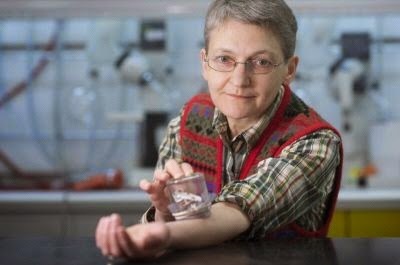 Gries' wife, SFU biologist Regine Gries, who is immune to bedbug bites, continues to allow the bedbugs to feed off her arms as the research team works with Victoria-based Contech Enterprises to develop what will be the first effective and affordable bait-and-switch trap to control the bugs. "I'm not too thrilled about this," says Mrs. Gries, "but knowing how much this technology will benefit so many people, it's all worth it." Working in bedbug-infested apartments in metropolitan Vancouver in British Columbia, Gries and his team targeted the common bedbug, Cimex lectularius, once believed to have been eradicated until a ferocious re-colonization hit industrialized countries. Their first pheromone blend attracted the bedbugs during lab experiments but not in apartments that had become infested, so they teamed up with SFU chemist Robert Britton, who is an expert at synthesizing natural products. After two years, the team found that the molecule histamine is what attracts bedbugs to human skin and keeps them there due to a composition that sends them a signal of safe haven. It took five months and 35 experiments for the team to find the next three compounds, which they eventually mixed with histamine and two others from previous research to create the concoction they plan to market.